Precious Moroccan argan oil with 4 other wonder oils. 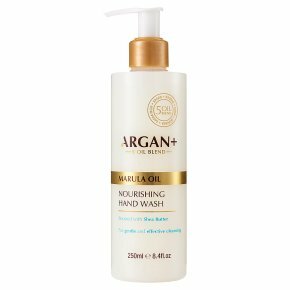 Gentle, effective cleansing.Argan+ Nourishing Hand Wash is a superior creamy formulation designed with 'miracle oil' Argan Oil, rich in vitamin E, and lavish ingredients to give hands a super gentle moisturising cleanse. The moisture-rich skin conditioning ingredients blending in theunique Argan+ Synergy help deliver the perfect hand cleansing experience for hands prone to dryness, and subject to frequent washing. Scented with our Argan+ signature aroma and boosted with Shea Butter to turn a daily routine into a nurturing treat. Argan+ Synergy is an all-natural 100% blend of precious Moroccan Argan Oil and 4 other amazing oils: Baobab, Kukui, Moringa and Sacha Inchi, all selected for their restorative, regenerating and nourishing properties. For external use only. Should irritation occur, rinse well and discontinue use. Avoid direct contact with eyes. If product gets into the eyes rinse well with water immediately. Due to natural oils, product colour may vary.